When we talk about indoor gardening we mean a garden, inside, that doesn't receive light from the sun. It may or may not exchange air with the outdoors. By controlling the amount of light, the air temperature, humidity and carbon dioxide levels, you are controlling all of the above ground environmental factors involved with growing plants. Your plants need light. Flowers growing outdoors on a bright summer day will stand at attention, facing the sun. The same flower on a gloomy overcast day will droop. You can't duplicate the sun indoors but you can come close enough with a grow light. Grow lights come in sizes from 150 watts to 1000 watts. 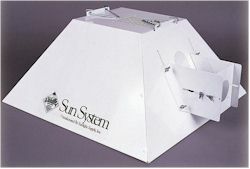 The 1000 watt systems can cover a growing area of about 8 foot square. 1) Reduce the amount of artificial light. Least expensive, and no fun. 2) Exchange the air in the indoor garden with the air outside. Not too costly. This can be done with some exhaust blowers. 3) Choose or upgrade to air-cooled grow lights. A bit more cost but has long term benefits. 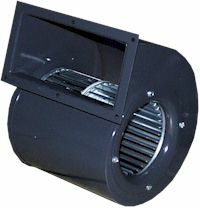 4) Cool the air in the garden with an air conditioner. Highest cost, very effective. Used in extreme cases. Controlling humidity is not usually a problem, plants like high humidity. If you're using a hydroponic garden inside, the evaporating water should provide enough humidity. If the humidity is too high, exchanging the air in the garden with the air outside may be a solution. This is only true if the air outside is drier. Another method would be to get a dehumidifier. CO2 depletion doesn't become a problem unless the indoor garden is sealed with no air exchange for a long time. If this is the case, then CO2 levels can actually drop. 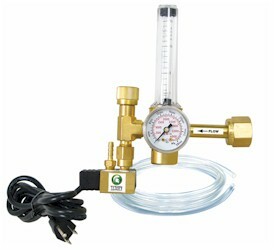 CO2 can be added to the garden from a tank, like the type used on a beer tap or from a CO2 generator.